Persimmon is the common name for several tropical and subtropical trees and shrubs in the genus Diospyros of the ebony wood family (Ebenaceae), characterized by alternate leaves, hard wood, and fleshy, globular fruits. Two well known persimmons are the Japanese persimmon (D. kaki) and the common persimmon, or eastern persimmon (D. virginiana). The name "persimmon" also is used for the edible fruit of these trees, which is a popular commercial fruit. Persimmons offer a unique flavor experience. Some varieties are soft when ripe and have a smooth, creamy texture and tangy-sweet flavor—but if even slightly unripe, it will pucker the mouth with a strong astringency (Herbst 2001). Others are ripe when firm and lack the astringency. They are eaten raw or cooked, fresh or dried, and are eaten out of hand or used in baked goods, puddings, and other deserts (Herbst 2001). The edible fruits are high in glucose, vitamin A, and vitamin C, with a balanced protein profile, and offer medicinal as well as culinary benefits. In addition, the wood of persimmons have been used for various purposes, including paneling in traditional Korean and Japanese furniture and in the manufacture of billiard cues. The genus to which persimmons belong, Diospryros, comprises about 500 species of deciduous and evergreen shrubs and trees. They are characterized by alternative leaves, the absence of terminal buds, dioecious or polygamous flowers with male flowers in axillary cymes and female flowers usually solitary, axillary (ZCZ 2008). Berries are fleshy to somewhat leathery, usually with calyx that is enlarged and persistent; seeds are often laterally compressed (ZCZ 2008). The majority of the members of this genus are native to the tropics, with only a few species extending into temperate climates. The genus includes species of commercial importance, either for their edible fruit (including the persimmons, D. kaki and D. virginiana) or for their timber. These include the two trade groups of ebony: The pure black ebony (notably D. ebenum, but also several other species) and the striped ebony (macassar, mun, and others). The genus, which is part of the ebony family, Ebenaceae, is variously known as the persimmon genus, ebony genus, star-apple genus, and jackal-berry genus on the basis of the common names of some of its more prominent members (IMCT 2003). Several species in the Diospryros genus have the common name of persimmon. The persimmon fruit is generally light yellow-orange to dark red-orange in color, and depending on the species, varies in size from 1.5 to 9 centimeters (0.5 to 4 inches) in diameter, and may be spherical, acorn-, or pumpkin-shaped. The calyx often remains attached to the fruit after harvesting, but becomes easier to remove as it ripens. The word persimmon is derived from putchamin, pasiminan, or pessamin, from Powhatan, an Algonquian language (related to Blackfoot, Cree, and Mohican) of the eastern United States, meaning "a dry fruit" (Merriam-Webster 1983). Diospyros kaki. The most widely cultivated species of persimmon is the Japanese kaki persimmon or kaki (柿, kaki), called "shizi" (柿子) in Chinese. These are sweet, slightly tart fruits with a soft to occasionally fibrous texture. 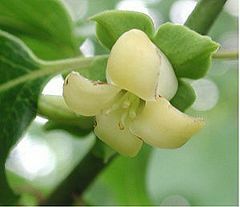 This species, native to China, is deciduous, with broad, stiff leaves. Cultivation of the fruit extended first to other parts of east Asia, and was later introduced to California and southern Europe in the 1800s, and numerous cultivars have been selected. It is edible in its crisp firm state, but has its best flavor when allowed to rest and soften slightly after harvest. The Japanese cultivar Hachiya is a widely grown cultivar. The fruit has a high tannin content, which makes the immature fruit astringent and bitter. The tannin levels are reduced as the fruit matures. Persimmons, like Hachiya, must be completely ripened before consumption. When ripe, this fruit comprises thick pulpy jelly encased in a waxy thin skinned shell. "Sharon Fruit" (named originally after Sharon plain in Israel) is the trade name for D. kaki fruit that has been artificially ripened with chemicals (CRFG 1996). It is also known as the "Korean Mango." Diospyros virginiana. The American persimmon is native to the eastern United States. It also is known as the common persimmon, among other names. The range of this tree is roughly that of the Southeastern United States. Its ranges encompass New England to Florida, and west to Texas, Oklahoma, and Kansas. The tree grows wild but has been cultivated for its fruit and wood since prehistoric times by Native Americans. D. virginiana is a small tree, usually varying from thirty to eighty feet in height, with a short slender trunk, and spreading, often pendulous branches (Keeler 1900). It has oval entire leaves. The tree produces fragrant flowers in summer, the flowers are dioecious so both male and female plants must be grown if seed is required. In the male flowers, there are sixteen stames, arranged in pairs, and the female flowers are solitary. The unisexual flowers are pollinated by insects and wind. Fruiting typically begins when the tree is about six years old. The fruit of the American persimmon is round or oval. The fruit color is usually orange, ranging to black. The fruit is astringent, which is reduced after subject to frost or a bletting process. Diospyros digyna. The black persimmon or black sapote is native to Mexico. Its fruit has green skin and white flesh, which turns black when ripe. Other species with the common name persimmon include D. sintenisii, the Chinese persimmon, and D. texana, the Texas persimmon (ITIS 1999). 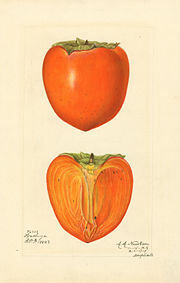 Japanese persimmon (cultivar "Hachiya")—watercolor 1887. The heart-shaped Hachiya is the most common variety of astringent persimmon. It is large, up to three inches in diameter, with a pointed, slightly elongated base (Herbst 2001). The Hachiya is soft when completely ripe, with a flavor described as "tangy-sweet," but if unripe even slightly will pucker the mouth with its strong astringency (Herbst 2001). Astringent persimmons contain very high levels of soluble tannins and are unpalatable if eaten before softening. The astringency of tannins is removed through ripening by exposure to light over several days, or artificially with chemicals such as alcohol and carbon dioxide, which change tannin into the insoluble form. This bletting process is sometimes jump started by exposing the fruit to cold or frost, which hastens cellular wall breakdown. These astringent persimmons can also be prepared for commercial purposes by drying. The non-astringent persimmon is most commonly sold as Fuyu. Fuyu persimmons are smaller and more tomato-shaped than Hachiya; both typically have a red-orange skin and flesh when ripe, but the Fuyu is still firm when ripe (Herbst 2001). Non-astringent persimmons are not actually free of tannins as the term suggests, but rather are far less astringent before ripening, and lose more of their tannic quality sooner. Non-astringent persimmons may be consumed when still very firm to very, very soft. There is a third type, less commonly available, the pollination-variant, non-astringent persimmons. When fully pollinated, the flesh of these fruit is brown inside and the fruit can be eaten firm. These varieties are highly sought after and can be found at specialty markets or farmers markets only. 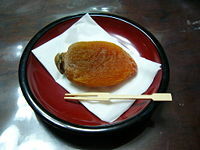 The three best known are "Tsurunoko," sold as "chocolate persimmon" for its dark brown flesh, Maru, sold as "cinnamon persimmon" for its spicy flavor, and Hyakume, sold as "brown sugar." Persimmons contain a good amount of vitamin A and some vitamin C (Herbst 2001), and are high in glucose. Persimmons are eaten fresh or dried, raw, or cooked. When eaten fresh, the peel is usually cut/peeled off and the fruit is often cut into quarters or eaten whole like an apple. The flesh ranges from firm to mushy and the texture is unique. The flesh is very sweet and when firm possesses an apple-like crunch. In China, Korea, Japan, and Vietnam, after harvesting, the Hachiya persimmons are prepared using traditional hand-drying techniques, outdoors for two to three weeks. The fruit is then further dried by exposure to heat over several days before being shipped to market. In Japan, the dried fruit is called hoshigaki (干し柿). In China, it is known as "shi-bing" (柿饼), in Korea it is known as gotgam (hangul: 곶감), and in Vietnam it is called hồng khô. It is eaten as a snack or dessert and used for other culinary purposes. In Korea, dried persimmon fruits are used to make the traditional Korean spicy punch, sujeonggwa, while the matured, fermented fruit is used to make a persimmon vinegar called gamsik cho (감식초), which is believed to have a wide variety of holistic properties. The hoshigaki tradition traveled to California with Japanese American immigrants. A few farms still practice the art (SFUSA). In some areas of Manchuria and Korea, the dried leaves of the fruit are used for making tea. The Korean name for this tea is ghamnip cha (감잎차). The persimmon also figures prominently in American culinary tradition. It can be used in cookies, cakes, puddings, salads, and as a topping for breakfast cereal. Persimmon pudding is a dessert using fresh persimmons. Persimmon pudding is a baked pudding that has the consistency of pumpkin pie but resembles a brownie and is almost always topped with whipped cream. Persimmons may be stored at room temperature (20°C) where they will continue to ripen. Ripe fruit can be stored for up to three days in a refrigerator (Herbst 2001). The raw fruit is used to treat constipation and hemorrhoids, and to stop bleeding. As such, it is not a good idea to consume too many persimmons at once—they can induce diarrhea. On the other hand, the cooked fruit is used to treat diarrhea and dysentery. The fruits of some persimmon varieties contain the tannins catechin and gallocatechin (Nakatsubo et al. 2002), as well as the anti-tumor compounds betulinic acid and shibuol, although the latter may also cause gastrointestinal problems. The soluble tannin shibuol found in unripened persimmons, upon contact with a weak acid, polymerizes in the stomach and forms a gluey coagulum that can affix with other stomach matter (Verstanding et al. 1989). The Merck Manual of Diagnosis and Therapy notes that consumption of persimmons has been known to cause bezoars that require surgery in over 90% of cases. Persimmon bezoars often occur in epidemics in regions where the fruit is grown (Cohen 2007). Horses may develop a taste for the fruit growing on a tree in their pasture and overindulge also, making them quite ill. It is often advised that persimmons should not be eaten with crab meat nor on an empty stomach. Though persimmon trees belong to the same genus as ebony trees, persimmon tree wood has a limited use in the manufacture of objects requiring hard wood. Persimmon wood is used for paneling in traditional Korean and Japanese furniture. In North America, the lightly colored, fine-grained wood of D. virginiana is used to manufacture billiard cues and shuttles (used in the textile industry). Persimmon wood was also heavily used in making the highest-quality heads of the golf clubs known as "woods," until the golf industry moved primarily to metal woods in the last years of the twentieth century. Persimmon woods are still made, but in far lower numbers than in past decades. Over the last few decades persimmon wood has become popular among bow craftsmen, especially in the making of traditional longbows. California Rare Fruit Growers (CRFG). 1996. Persimmon: Diospyros kaki Linn. California Rare Fruit Growers. Retrieved August 5, 2008. Cohen, S. 2007. Gastrointestinal disorders. Bezoars and foreign bodies. Bezoars. Merck Manuals Online Medical Libraries. Retrieved August 5, 2008. Integrated Taxonomic Information System (ITIS). 1999. Diospyros L. ITIS Taxonomic Serial No. : 23853. Retrieved August 5, 2008. Iziko Museums of Cape Town (IZCT). 2003. Genus: Diospyros (ebony, persimmon, star-apple, jackal-berry genus). Biodiversity Explorer. Retrieved August 5, 2008. Merriam-Webster. 1983. Webster's Ninth New Collegiate Dictionary. Springfield, MA: Merriam-Webster. ISBN 0877795088. Nakatsubo, F., K. Enokita, K. Murakami, K. Yonemori, A. Sugiura, N. Utsunomiya, and S. Subhadrabandhu. 2002. Chemical structures of the condensed tannins in the fruits of Diospyros species. Journal of Wood Science 48(5). Retrieved August 5, 2008. Slow Food USA (SFUSA). n.d. Japanese massaged dried persimmon: Hoshi Gaki. Slow Food USA. Retrieved August 5, 2008. ZipCodeZoo (ZCZ). 2008. Diospyros (genus). Bay Science Foundation. Retrieved August 5, 2008. This page was last modified on 12 August 2008, at 14:40.